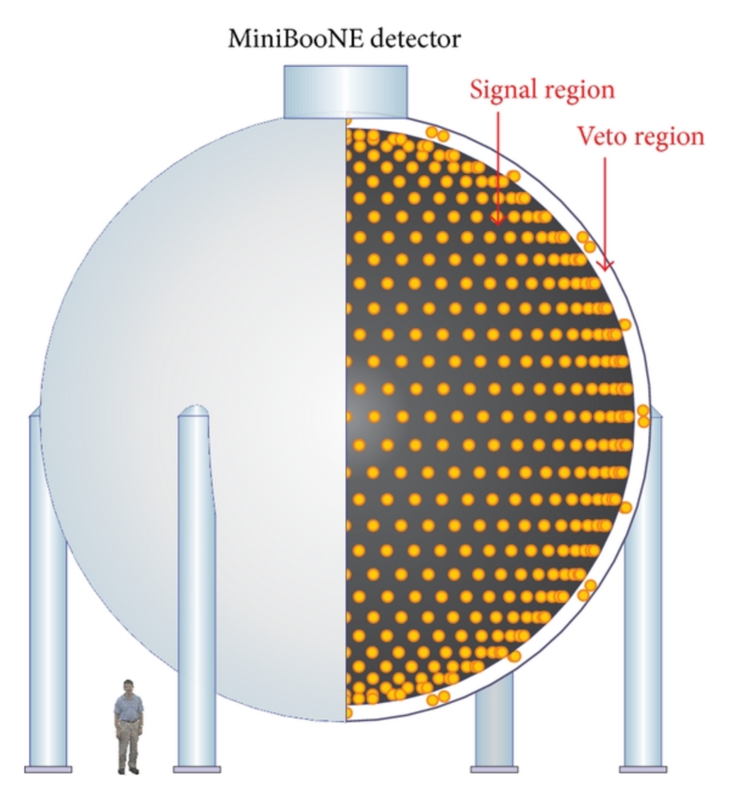 • The MiniBooNE Collaboration, Observation of a significant excess of electron-like events in the MiniBooNE short-baseline neutrino experiment. In brief, the experiment creates a beam of muon neutrinos (or antineutrinos—they can do either one). Then they check, with a detector 541 meters away, to see if any of these particles have turned into electron neutrinos (or antineutrinos). They’ve been doing this since 2002, and they’ve found a small tendency for this to happen. This seems to confirm findings of the Liquid Scintillator Neutrino Detector or ‘LSND’ at Los Alamos, which did a similar experiment in the 1990s. People in the MiniBooNE collaboration claim that if you take both experiments into account, the results have a statistical significance of 6.1 σ. This means that if the Standard Model is correct and there’s no experimental error or other mistake, the chance of seeing what these experiments saw is about 1 in 1,000,000,000. There are 3 known kinds of neutrinos: electron, muon and tau neutrinos. Neutrinos of any kind are already known to turn into those of other kinds: these are called neutrino oscillations, and they were first discovered in the 1960’s, when it was found that 1/3 as many electron neutrinos were coming from the Sun as expected. The neutrinos stood out as weird in two ways: we thought they were massless, and we thought they only come in a left-handed form—meaning roughly that they spin clockwise around the axis they’re moving along. People did a bunch of experiments and wound up changing the Standard Model. Now we know neutrinos have nonzero mass. Their masses, and also neutrino oscillations, are described using a 3×3 matrix called the lepton mixing matrix. This is not a wacky idea: in fact, quarks are described using a similar 3×3 matrix called the quark mixing matrix. So, the current-day Standard Model is more symmetrical than the earlier version: leptons are more like quarks. There is, however, still a big difference! We haven’t seen right-handed neutrinos. MiniBooNE and LSND are seeing muon neutrinos turn into electron neutrinos much faster than the Standard Model theory of neutrino oscillations predicts. There seems to be no way to adjust the parameters of the lepton mixing matrix to fit the data from all the other experiments people have done, and also the MiniBooNE–LSND data. If this is really true, we need a new theory of physics. The most conservative change to the Standard Model would be to add three right-handed neutrinos to go along with the three left-handed ones. This would not be an ugly ad hoc trick: it would make the Standard Model more symmetrical, by making leptons even more like quarks. If we do this in the most beautiful way—making leptons as similar to quarks as we can get away with, given their obvious differences—the three new right-handed neutrinos will be ‘sterile’. This means that they will interact only with the Higgs boson and gravity: not electromagnetism, the weak force or the strong force. This is great, because it would mean there’s a darned good reason we haven’t seen them yet! Neutrinos are already very hard to detect, since they don’t interact with electromagnetism or the strong force. They only interact with the Higgs boson (that’s what creates their mass, and oscillations), gravity (because they have energy), and the weak force (which is how we create and detect them). A ‘sterile’ neutrino—one that also didn’t interact with the weak force—would be truly elusive! In practice, the main way to detect sterile neutrinos would be via oscillations. We could create an ordinary neutrino, and it might turn into a sterile neutrino, and then back into an ordinary neutrino. This would create new kinds of oscillations. And indeed, MiniBooNE and LSND seem to be seeing new oscillations, much more rapid than those predicted by the Standard Model and our usual best estimate of the lepton mixing matrix. So, people are getting excited! We may have found sterile neutrinos. There’s a lot more to say. For example, the SO(10) grand unified theory predicts right-handed neutrinos in a very beautiful way, so I’m curious about what the new data implies about that. There are also questions about whether a sterile neutrino could explain dark matter… or what limits astronomical observations place on the properties of sterile neutrinos. One should also wonder about the possibility of experimental error! I would enjoy questions that probe deeper into this subject, since they might force me to study and learn more. Right now I have to go to Joshua Tree! But I’ll come back and answer your questions tomorrow morning. This entry was posted on Saturday, June 2nd, 2018 at 5:12 pm and is filed under physics. You can follow any responses to this entry through the RSS 2.0 feed. You can leave a response, or trackback from your own site. It doesn’t really matter if somebody thinks the experiment is “dodgy”. More interesting are possible sources of experimental error, and what the MiniBooNE team did to address these. Thanks for the update! LSND has always been a mystery and the miniboone results over the years have been pointing to an anomaly as well, but not necessarily the same anomaly. I look forward to reading the paper and perhaps having other comments. • Adam Falkowski, Other neutrino anomalies, Résonaances, 27 February 2012. Great article, John. Can you point out a good article explaining how SO(10) proposes an unification in physics? Thanks. • John Baez and John Huerta, The algebra of grand unified theories, Bull. Amer. Math. Soc. 47 (2010), 483–552. This is for mathematicians: it’s an introduction a little bit of particle physics, together with the group theory used in the SO(10) and SU(5) grand unified theories. It explains why right-handed neutrinos show up. But there’s a huge amount that it does not do! For physicists, there are probably much better reviews that treat the various physical problems the SO(10) GUT does or does not solve. But I have to take out the laundry now! I suppose I’m more in the physics campsite, but thanks for the reference! I’m just doing that to see if i can learn anything.I’m still trying to go through that book on applied category theory—monoidal categories, etc. Many of examples in that free book I have seen discussed in different terms–set theory, group theory and graph theory. Those for me are easier and more intuitive—numbers, functions, and pictures. I feel like I am learning the alphabet and arithmatic again. I know people who are considered ‘functionally illiterate’–dropped out of elementary school and never went back–but they know how to use smart phones. I’m functionally illiterate in category theory–maybe they should have taught that in my schools i attended. Maybe there should be a book ‘category theory for dummies’ for people like me. I’m irght handed (and dyslexic too–not good for math– + /= – but sometimes i write it that way) but for some things i’m left handed. Perhaps there is a political bias against right handed neutrinos. Also if they are not following the laws of the standard model, perhaps they should be prosecuted. I missed my trip to West Va mtns this morning due to this local situation which is in the news–drugs, guns, violence and more. I have never been to Joshua Tree –i think it refers to a kind of tree– but I once climbed up near Mt Whitney from east side and saw bristlecone pines–those are old trees–some maybe 4000 years old. Scientists killed one by taking a core for dating its age. Sort of like Heisenberg UP—observer effects the observed. as always an interesting blog article. Here’s something that’s confusing me about the neutrino handedness problem: if neutrinos aren’t massless (and so don’t travel at the speed of light), then wouldn’t a left-handed neutrino in one reference frame be a right-handed neutrino in another, and vice versa? So how could a right-handed neutrino be sterile if its left-handed counterpart isn’t? I remember hearing about an idea that, if you accelerated past a high-speed left-handed neutrino, it would appear to become a right-handed antineutrino. I think this would be called a Majorana neutrino, but these were ruled out by experiment—I don’t understand yet how that worked either. […] wouldn’t a left-handed neutrino in one reference frame be a right-handed neutrino in another, and vice versa? Very good question, and unlike most very good questions this one has a short answer: no. If you’ve got a massless spinning particle, moving at the speed of light, you can never outrun it, so everyone can agree on whether it’s spinning clockwise or counterclockwise along the axis it’s moving along. For a massive spinning particle things get more tricky. Because it’s moving slower than light, no matter how fast it’s moving you can outrun it and see it as moving the other way! So as you wisely note, different people with different rest frames can see it spinning either clockwise or counterclockwise along the axis it’s moving along. • Chirality vs. handedness, Physics StackExchange. Does it make sense? Maybe I can cook up something better. My first inclination is this. Take a spin-1/2 particle, accelerate it so it’s moving almost at the speed of light relative to you, and then measure its spin along its axis of motion. If it’s a left-handed particle you’ll find it to be spinning clockwise with a very high probability. This probability approaches 1 as its speed approaches that of light. I hope this is right; I haven’t had time to do any calculations! Yes, that’s a Majorana neutrino—but these have not been ruled out! 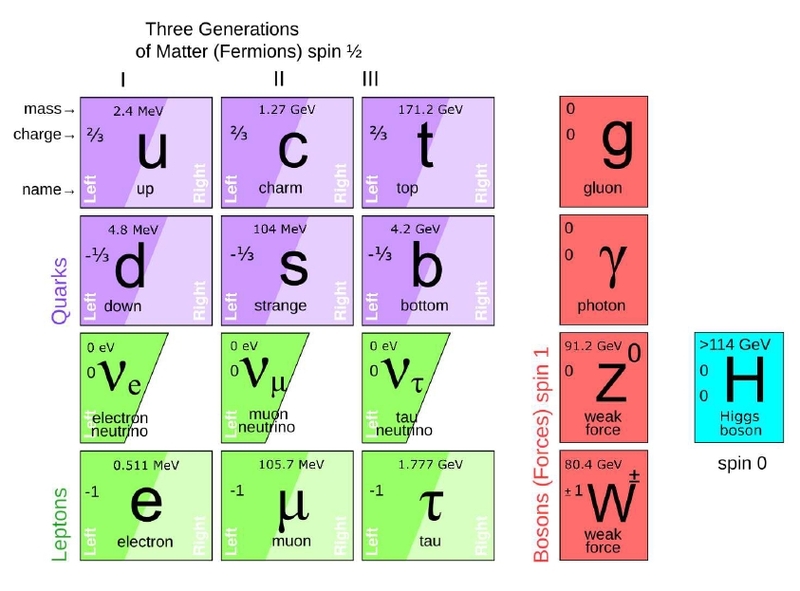 A Dirac fermion has nonzero mass and comes in 4 states: left-handed particle, right-handed particle, left-handed antiparticle and right-handed antiparticle. The electron is a good example. A left-handed Weyl fermion has zero mass and comes in 2 states: left-handed particle and right-handed antiparticle. We used to think neutrinos were left-handed Weyl fermions. A right-handed Weyl fermion has zero mass and comes in 2 states: right-handed particle and left-handed antiparticle. We used to think antineutrinos were right-handed Weyl fermions. A Majorana fermion has nonzero mass and comes in 2 states: right-handed and left-handed. However, it is its own antiparticle! And now I must go to Joshua Tree. Thank you for the reply! I hope you’re enjoying Joshua Tree. I appreciate the link to the Physics StackExchange Q&A; doesn’t the explanation there say that handedness is not Lorentz-invariant though? Or is what we’re calling neutrino handedness what they’re calling chirality, so saying “neutrinos are all left-handed” is a statement about how the neutrino field transforms under the Lorentz group? Trying to talk like a physicist about representation theory feels like speaking in a foreign language; I’m never sure what I’m saying is even grammatical, let alone correct. In other news, how exciting that Majorana neutrinos haven’t been ruled out! I have no idea why I thought they were. Are the MiniBooNE observations consistent with neutrinos being Majorana fermions instead of Dirac fermions? Joshua Tree was plenty of fun as usual! Or is what we’re calling neutrino handedness what they’re calling chirality, so saying “neutrinos are all left-handed” is a statement about how the neutrino field transforms under the Lorentz group? Right. I was using “handedness” to mean “chirality”; to me “chirality” is just the Latin word for handedness: it sounds cooler but it will be understood by fewer people, so I avoided it in a blog article that was supposed to be easy to read. Referring you to a StackExchange question written by someone who was trying to distinguish handedness and chirality was a bad move on my part. But okay, let’s drop “handedness” say “chirality”. If you read the Physics Stackexchange reply with extreme care—I don’t claim it’s a model of clarity—you’ll see it opposes “chirality” and “helicity”. Chirality is Lorentz-invariant while helicity is not. In general they can be different, while for massless particles they must agree. Trying to talk like a physicist about representation theory feels like speaking in a foreign language; I’m never sure what I’m saying is even grammatical, let alone correct. I’m a bit of a physicist but more of a mathematician. It sounds like you know representation theory. If it’s okay for me to use a bunch of math jargon, I could talk about this much more easily. The helicity of a particle is right-handed if the direction of its spin is the same as the direction of its motion. It is left-handed if the directions of spin and motion are opposite. By convention for rotation, a standard clock, with its spin vector defined by the rotation of its hands, tossed with its face directed forwards, has left-handed helicity. Mathematically, helicity is the sign of the projection of the spin vector onto the momentum vector: left is negative, right is positive. For massless particles—such as the photon, the gluon, and the (hypothetical) graviton—chirality is the same as helicity; a given massless particle appears to spin in the same direction along its axis of motion regardless of point of view of the observer. For massive particles—such as electrons, quarks, and neutrinos—chirality and helicity must be distinguished. In the case of these particles, it is possible for an observer to change to a reference frame that overtakes the spinning particle, in which case the particle will then appear to move backwards, and its helicity (which may be thought of as ‘apparent chirality’) will be reversed. A massless particle moves with the speed of light, so a real observer (who must always travel at less than the speed of light) cannot be in any reference frame where the particle appears to reverse its relative direction, meaning that all real observers see the same helicity. Because of this, the direction of spin of massless particles is not affected by a Lorentz boost (change of viewpoint) in the direction of motion of the particle, and the sign of the projection (helicity) is fixed for all reference frames: the helicity of massless particles is a relativistic invariant (i.e. a quantity whose value is the same in all inertial reference frames). With the discovery of neutrino oscillation, which implies that neutrinos have mass, the only observed massless particle is the photon. The gluon is also expected to be massless, although the assumption that it is has not been conclusively tested. Hence, these are the only two particles now known for which helicity could be identical to chirality, and only one of them has been confirmed by measurement. All other observed particles have mass and thus may have different helicities in different reference frames. It is still possible that as-yet unobserved particles, like the graviton, might be massless, and hence have invariant helicity like the photon. I would change the last sentence to “we know from gravitational wave observations that the graviton must have as mass at most eV and we know that if the graviton were not massless light passing the Sun would be bent 25% less than is observed unless unknown physics intervenes, so we know it’s massless with just as much or even more certainty than we know the photon is massless. The big difference is that we haven’t directly observed gravitons.” But I digress! Your first guess about what neutrino handedness would imply for measurement doesn’t make physical sense to me right now (how could two observers moving in opposite directions at nearly the speed of light each have probability nearly 1 of the same measurement having different outcomes? ), but that’s okay. Yeah, I thought about that and thought I’d seen a way around it: namely, as you apply Lorentz transformations to the momentum you also have to apply Lorentz transformations to the spin. But I could be completely wrong. I’ll need to do a calculation, or at least think harder, to see what’s really going on. My basic reasoning was: helicity agrees with chirality for massless particles, and a particle moving at almost the speed of light behaves very similarly to a massless particle (in that its momentum vector lies almost on the lightcone), so we should be able to say that helicity almost agrees with chirality in this limit. But then there’s the common-sense reasoning you mentioned, which points the other way. I imagine this is a case where the math says what it says and I just have to come to terms with it. It’s always possible to get a good simple intuition for what the math says after you think about it long enough, but it’s also good practice to try to get the right answers using intuition instead of messing with equations; that’s what I was trying to do. It’s instructive when one screws up. Thanks for continuing to explain this to me! Yes, I have some experience with representation theory, so please feel free to use it if that makes things clearer. I do have trouble interpreting sentences like “The chirality… is determined by whether the particle transforms in a right- or left-handed representation of the Poincaré group.” What mathematical object represents a particle? Is it a certain representation of the Poincaré group? A certain vector in that representation? In physics, when one says “particle”, it can either mean “a specific type of particle” or “an individual particle of a specific type”. With training, you are supposed to always know from context what’s meant. For example, if I say “the electron has charge -1”, I mean “any particle of type ‘electron’ has charge -1”. The strange phrase “the electron”, as if there were only one, is supposed to be a giveaway. If I say “an electron with speed near c has relativistic mass greatly exceeding its rest mass”, I’m referring to any individual particle of the type ‘electron’ with the said property. If I say “the experiment saw an electron with energy 2 GeV”, I mean one individual particle of the type ‘electron’ with the said property. Energy is a property of individual particles, not types of particles. It’s not easy to summarize the rules for deciding what’s meant, but usually there’s only one interpretation that makes the sentence have a chance of being true, and that’s the one that’s meant. So, in the sentence ““The chirality… is determined by whether the particle transforms in a right- or left-handed representation of the Poincaré group”, they’re referring to a specific type of particle, like ‘electron’ or ‘muon neutrino’, not an individual particle. Why? Because in relativistic quantum field theory, a type of particle corresponds to an irreducible representation of the Poincaré group (times some other group, like SU(3) × SU(2) × U(1). An individual particle of that type corresponds to a unit vector in that representation, mod phases. So, the sentence could only possibly be true if we were talking about a type of particle. I may dive into more later. Now that I see you’re firmly on the math side of the math/physics communication barrier, I know more about how to talk. This is extremely helpful, thank you! It sounds like chirality is a property of a type of particle (i.e. representation) and helicity is a property of an individual particle (i.e. vector in that representation), which makes everything make more sense. No wonder chirality is Lorentz-invariant and helicity is not (in general). It sounds like chirality is a property of a type of particle (i.e. representation) and helicity is a property of an individual particle (i.e. vector in that representation), which makes everything make more sense. No wonder chirality is Lorentz-invariant and helicity is not (in general). This is a great guess, and it’s almost right. The symmetry group in relativistic quantum field theory is the double cover of the Poincaré group. If we define “a type of particle” to be an irreducible represention of your guess is 100% correct. And it’s easy to argue that this is the right definition of “a type of particle”. So let’s start by using this definition! Helicity is definitely a property of an individual particle. Given any representation of there’s a helicity operator acting on this representation. It has eigenvalues . We say an individual particle has helicity if it’s described by a unit vector in our representation that’s an eigenvector of the helicity operator with eigenvalue $S.$ Intuitively, it’s spinning with angular momentum in the direction of its motion! There is also a chirality operator acting on any representation of However, unlike the helicity operator, this operator is invariant under the action of In other words, it commutes with everything in The center of has two elements. The chirality operator is the action of the non-identity element of the center. Physicists call the chirality operator It squares to the identity, so the only eigenvalues it can have are +1 and -1. These have the meaning of “right-handed” and “left-handed”. By Schur’s lemma, the chirality operator has only one eigenvalue in any irreducible representation of So, using our definition of a “type of particle”, any type of particle is either left-handed or right-handed. For a massless spin-1/2 particle, the helicity is actually -invariant, and it’s 1/2 times the chirality. Unfortunately physicists sometimes use the word “type of particle” a bit more broadly, so that sometimes the electron/positron is called considered a type of particle instead of two separate types of particle, the electron and the positron. When physicists do this, a type of particle corresponds to a possibly reducible representation of Then chirality can have two eigenvalues (both +1 and -1) in this representation. Then we can speak of individual particles of this type being either left-handed or right-handed. If you’re up for it, I have another question about how physicists talk about representation theory: say we have a theory described by some non-irreducible representation that decomposes into several irreducible subrepresentations. Would those subrepresentations be the types of particles in that theory? That would be a very nice consistent attitude. Unfortunately, as we’ve just seen, there are times when physicists use “type of particle” to mean a possibly reducible representation. What if an irreducible representation is repeated in the decomposition: ? Are there two types of particles that are identical in every way? Identical in every way that can be captured using the representation theory of the group under consideration. But there can be more to physics than this! For example, in my example above, the electron and the positron are described by the same irreducible representation of But they have different charges. It’s fun to think about this example a tiny bit more. The “electron/positron” is described by a direct sum of two copies of the same representation of Acting on this direct sum there is the chirality operator. It has two eigenvalues, +1 and -1. Since it’s an invariant operator, the two eigenspaces are each representations of This turns out to give a different way of chopping our reducible representation into two reducible parts! These could be called the “right-handed electron/positron” and the “left-handed electron/positron”. See how it gets sneaky and interesting? Right; I just showed you how two different ways to chop a reducible representation into irreducible summands can both be physically interesting. Whew! It takes a long time to fully explain things, which is why most people don’t bother. But it’s satisfying. Thank you again! Phrased in terms of reps and irreps the idea of “types of particles” makes so much more sense. I notice that in your example of two different decompositions of a representation into subrepresentations (via charge or handedness) there’s a common refinement into four subrepresentations—right-handed electrons, left-handed electrons, right-handed positrons, and left-handed positrons—so the whole representation looks something like and we were decomposing it into the first time and the second time. I was about to ask whether there’s an example where we decompose a single sum of identical irreducible representations in two different ways (so that they can’t have a common refinement), but is that perhaps what neutrino oscillation is all about? If “neutrinos” form a representation that can be divided up into identical subrepresentations either by flavor or by mass , is the point that these aren’t necessarily the same decomposition? So if the sun creates a neutrino in a “small” mass eigenstate, it could be a superposition of different flavors? And Fermilab is doing the same thing but with the decompositions by mass and handedness? I was about to ask whether there’s an example where we decompose a single sum of identical irreducible representations in two different ways (so that they can’t have a common refinement), but is that perhaps what neutrino oscillation is all about? If “neutrinos” form a representation that can be divided up into identical subrepresentations either by flavor or by mass , is the point that these aren’t necessarily the same decomposition? So if the sun creates a neutrino in a “small” mass eigenstate, it could be a superposition of different flavors? It’s certainly true that the ‘mass basis’ for neutrinos is different than the ‘flavor basis’. And it’s certainly true that neutrino oscillations are caused by this fact. However, these new summands are not subrepresentations. And that’s exactly why there can be neutrino oscillations! But it doesn’t. That’s why electron neutrinos can turn into neutrinos of other flavors, if you just wait. This is clearing up a lot of my misconceptions, thank you! That makes a lot more sense why neutrinos would oscillate and not just have a chance of being observed in the wrong flavor. Are there experiments, where this has been tested? Do you know? That is I understand the mental picture that if you overtake a rotating particle and look onto it, then the rotation direction will appear reversed and thus the magnetic moment. Apriori one could wonder that since electrical and magnetical fields change roles depending on frames that something strange might happen, but lets assume that at least theoretically this is still in line with the above picture – but then one may still wonder about the fact that spin might not always be explained with charges rotating around one axis. Are there experiments, where this has been tested? Any spinning massive object with its angular momentum pointing in the direction of its velocity will look like its angular momentum is pointing in the opposite direction of its velocity if you run faster than it. It’s easy to test this for large objects, a bit harder for small objects… but someone must have done it for electrons. I doubt there’s a paper on this; there would only be a paper if someone discovered it wasn’t true. This would be an immensely shocking discovery! Any spinning massive object with its angular momentum pointing in the direction of its velocity will look like its angular momentum is pointing in the opposite direction of its velocity if you run faster than it. As said I have an uneasyness with this picture, in particular this picture assumes somewhat that there exists a “neutrino charge” which behaves according to some kind of (hidden) Maxwells equations but even if one would accept this assumption for the moment then as the Wikipedia article says if an observer is faster the particle appears to move backwards, that would actually mean that the helicity would stay the same, because angular momentum (and therefore magnetic moment) AND relative velocity switch sign. But then in electrodynamics electrical and magnetic fields change when changing the frame and I have no idea what this does to the whole picture. And then one gets already for the electron an anomalous magnetic moment, if one takes quantum effects into acount, who knows what this is for the neutrino? I doubt there’s a paper on this; there would only be a paper if someone discovered it wasn’t true. Why? I don’t know how difficult it is to measure a neutrino’s spin or hellicity, but such an experiment could eventually say something about wether a neutrino needs to have a mass or not. Hmm. Good point. This contradicts things I believe, but it’s also a logical consequence of things I’ve said! So, I’ll have to debug my understanding. What I wanted was for the electron to be described by a representation , the positron to be described by another copy of for the electron/positron to be described by the direct sum and for chirality to give another way of decomposing this direct sum into two copies of which correspond to the ‘right-handed electron/positron’ and the ‘left-handed electron positron’. However, it’s not consistent with my claim that the chirality operator comes from a central element of the double cover of the Poincaré group. This would make the representation for a right-handed particle where chirality takes the value +1, not isomorphic to the representation for the left-handed electron/positron. Okay, I see the problem now. I was being sloppy in my use of the term ‘Poincaré group’. The original Poincaré group is the isometry group of Minkowski spacetime. It has four connected components! There is also a smaller group, the connected component containing the identity, which deserves to be called . For example, reflection in any space direction gives an element of that does not commute with In fact, acting on any representation, this element will map chirality eigenvectors with chirality +1 to chirality eigenvectors with chirality -1, and vice versa. Okay, so a representation corresponding to electrons of both handednesses would be an irreducible representation of , but as a representation of the smaller group , it breaks up as a direct sum of two smaller irreps, and you can use the operators to project onto them. That fits with what I’ve been trying to glean from the wikipedia and stackexchange pages. How nice that the double cover of the identity component of P is the right group to study—then we can just look at representations of its Lie algebra instead! Beta decay is a kind of radioactive decay of a nucleus in which a neutron turn into a proton, an electron and an electron antineutrino. In double beta decay, two neutrons turn into two protons, two electrons and two electron antineutrinos! But if neutrinos were their own antiparticles, the two antineutrinos could annihilate each other. So we’d have “neutrinoless double beta decay”. 12 experiments have looked for neutrinoless double beta decay, and only one claims to have seen it. But it could be a very rare occurrence, so we can’t rule it out yet. 10 more experiments have been proposed to look for it! In particular, the background due to neutral-current production of neutral pions seems a source worth discussing in excruciating detail, as its predicted energy shape is very similar to that of the excess: bump it up by 50%-60% and the anomaly is gone. The gamma background from neutral-current (NC) π0 production and Δ → Nγ radiative decay  are constrained by the associated large two-γ sample (mainly from Δ production) observed in the MiniBooNE data, where the new π0 data agrees well with the published data . This paragraph IMHO raises more questions than it dissipates. But I believe this article is too long already to delve into these technical details – I am not a true expert in these matters so my comments would probably be deceiving or plain fallacious. But I remain sceptical of the interpretation of this experimental result in terms of a new physics such as sterile neutrinos or a second oscillation solution at large δm. Why ? In my courses of statistics for data analysis I explain my students that it is rare to mis-evaluate statistical uncertainties in a way that makes new signals arise from nothing. For those, a type-I error rate of 3×10-7 (which corresponds to a 5-sigma significance for a one-tailed test) is a safe threshold. But when the veridicity of a result is dominated by the knowledge of systematic uncertainties, things become quite different. We know from gravitational wave observations that the graviton must have as mass at most and we know that if the graviton were not massless light passing the Sun would be bent 25% less than is observed unless unknown physics intervenes, so we know it’s massless with just as much or even more certainty than we know the photon is massless. The big difference is that we haven’t directly observed gravitons. This is also fascinating to me! There’s that much of a difference between gravitons being massless and having an extremely small mass? I’m surprised by the discontinuity. • Adam Falkowski, Massive gravity, or you only live twice, Résonaances, 19 April 2018. This blog, by the way, is a great source of information on particle physics! That’s very cool, thank you! I believe there are several things that need to be pointed out regarding the MiniBooNE results, which are all reasons for neutrino phenomenologists not being nearly as excited about this as you might expect. First and foremost of these is the OPERA exclusion from the money plot, which measures the exact same channel as MiniBooNE with the same L/E in an accelerator experiment. The exclusion limits in the plot are actually all from other experiments examining the same channel and so the oscillation interpretation of the best-fit is directly excluded by other experiments. On top of this, something that is not shown in the figure are the exclusion limits that would come from other oscillation channels just from the assumption of probabilities adding up to one. This is where atmospheric and reactor neutrinos come in and this essentially rules out the entire fit region. The second thing to note is that the fit is a rather bad one. Although the chi2/dof is seemingly fine, the signal is concentrated in a few bins at low energy where the background is the largest and likely most poorly understood (the first MiniBooNE papers did not include this region as a signal region exactly because of this). The rise with energy is simply put just too steep to be due to oscillations. Third, the people doing global fits with sterile neutrinos typically disregard this region of MiniBooNE data because of what I just mentioned. Regardless of what they do with steriles, they end up with a fit that does not explain the MiniBooNE excess at low energies. Some find a good fit with steriles and LSND results, but that result would typically be compatible with a MiniBooNE excess at higher energies, as was initially expected. MiniBooNE itself does not provide much statistical weight to those fits. With the global picture in mind, it seems very unlikely to me that the appropriate resolution of this discrepancy is sterile neutrinos. It is very possible that something is afoot, be it new physics or a background that is poorly understood, but that something is probably not sterile neutrinos. The best way of testing this in the future is using experiments with multiple detectors to decrease the reliance on Monte Carlo simulations of backgrounds and fluxes. The Fermilab short-baseline program should do pretty well in this regard. Also, regarding the right-handed neutrinos in the canonical seesaw, they are typically not Dirac. We introduce an additional right-handed SM singlet to build Dirac mass terms via the Yukawa couplings to the left-handed lepton doublet in the same way we give up-type quarks masses. The big difference is that the right-handed neutrinos are SM singlets and therefore allow for a heavy Majorana mass term between them. The resulting neutrinos (both light and heavy) are Majorana particles. Of course, you have no a priori handle on the scale of the right-right Majorana mass and if it is very very small you end up just with light pseudo-Dirac neutrinos. I am thinking (if the discrepancy in the lepton mixing matrix resists the experimental verification) that it is possible the existence of an infinite family of leptons: the observation of the tau was indirect observation, due to the short lifetime of the tau, so that if others leptons exist (with lower lifetime) then the direct observation could be even more complex (maybe impossible experimentally), and the lepton matrix mixing could lead to an indirect observation of the existence of a family.